Sink your fork into this buttery, fall-off-the-bone apple cider roasted chicken dinner with crispy potatoes and onions! Sweet and salty flavors combine to make this easy, mouthwatering meal an autumn family favorite. Since moving to Massachusetts over the summer, my family and I have been loving the cooler air and outdoorsy activities. Especially lately, as the leaves are turning and fall is tiptoeing around the corner. We have already made a decent dent in our fall bucket list, between pie baking, puddle jumping, pumpkin patching, and my favorite… apple picking! On a sunny, damp Sunday in early September, we grabbed some friends and some big buckets for a day of apple picking. And a little leaf-peeping on the side! Between the three of us, including my ambitious three-year-old, we ended up hauling home forty pounds of crisp apples. We also nabbed a jug of fresh apple cider, and a dozen apple cider donuts for breakfast the next morning. Thankfully, my family loves the fruit! Between our adventure out, and our surprise apple tree in our new home, we still have a ways to go with our apple stash. 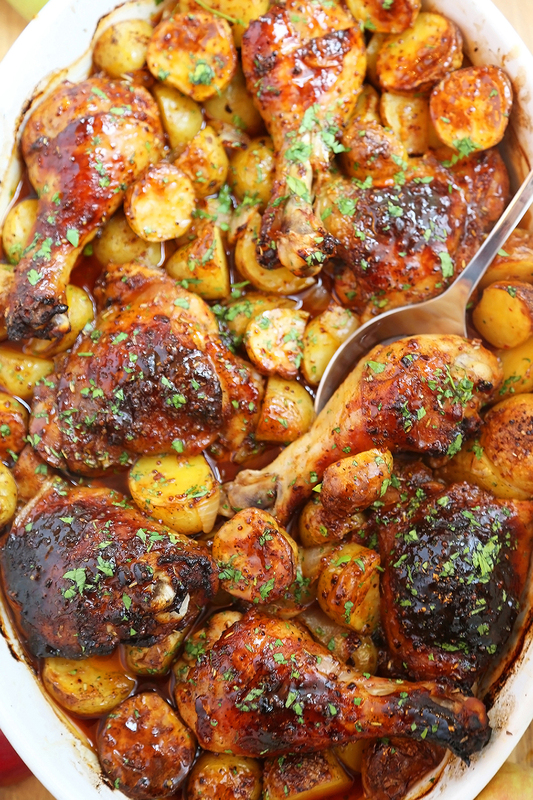 But, I have been able to make good use of it, especially with this sweet-and-savory chicken and potato dish! With our apple supply in overdrive, I quickly got to work whipping up some goodies, like my Quick & Easy Apple Tart, Apple Pancake Rings, and Apple Cider Donut Holes, to name a few. I also gifted about fifteen pounds to our friendly neighbor, who promptly surprised me with a delicious apple crisp! Safe to say, my sweet tooth was satiated. I was loving all the autumn-inspired treats, but craving something a savory, scrumptious dish (with apples… because, well, we were drowning in them by the bushel-full) that could also serve as a one-pan family meal. 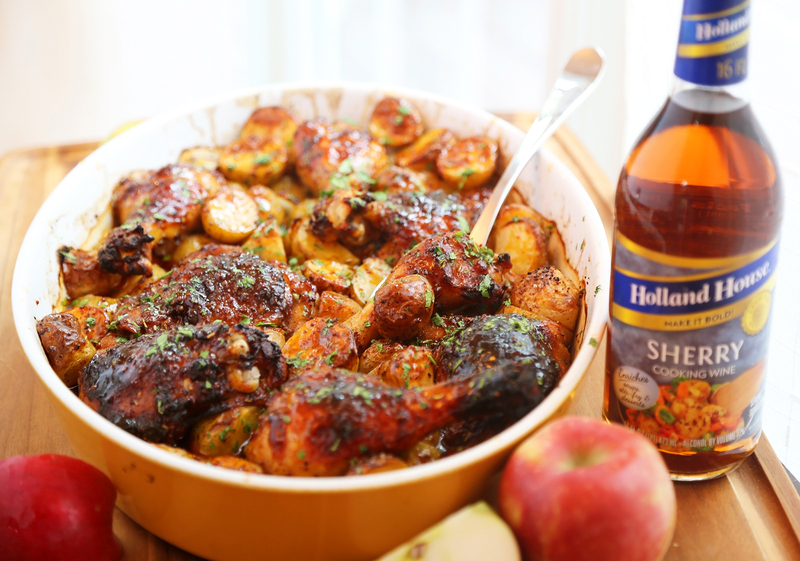 I have always wanted to combine richly spiced, sweet apple cider with tender-crispy chicken. 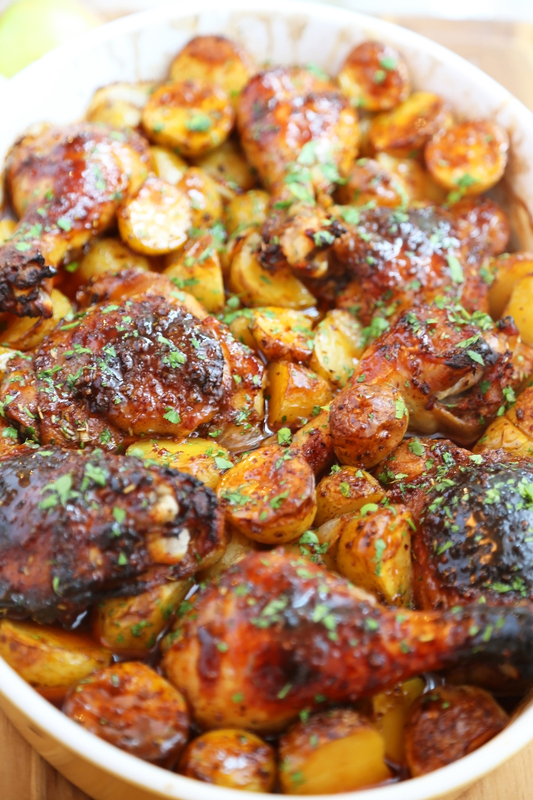 So, after some trial-and-error to come up with the best flavors, and this unbelievable, easy apple-glazed chicken and potato recipe was born! To begin, grab about 8 pieces of bone-in, skin-on chicken. I chose 4 chicken legs and 4 chicken thighs, because they fit well together, make a beautiful presentation, and if you’re serving several people, everyone gets one piece of each. Pro tip: trim off any excess skin, and pat the pieces dry to make sure they get nice and crisp in the oven! Next, make your magical, tenderizing chicken marinade. This is a mixture of apple cider, olive oil, fresh garlic, smoked paprika, rosemary, allspice, onion powder, and a sprinkle of salt and pepper. (If you don’t have these exact ingredients, feel free to improvise with something similar! I.e., thyme instead of rosemary, a little nutmeg and cloves instead of allspice, etc.) Combine the chicken in a large bowl or re-sealable plastic bag with your marinade, and toss the pieces to coat them well. About 30 minutes should do it, or you can allow the chicken to marinade up to 1 day. 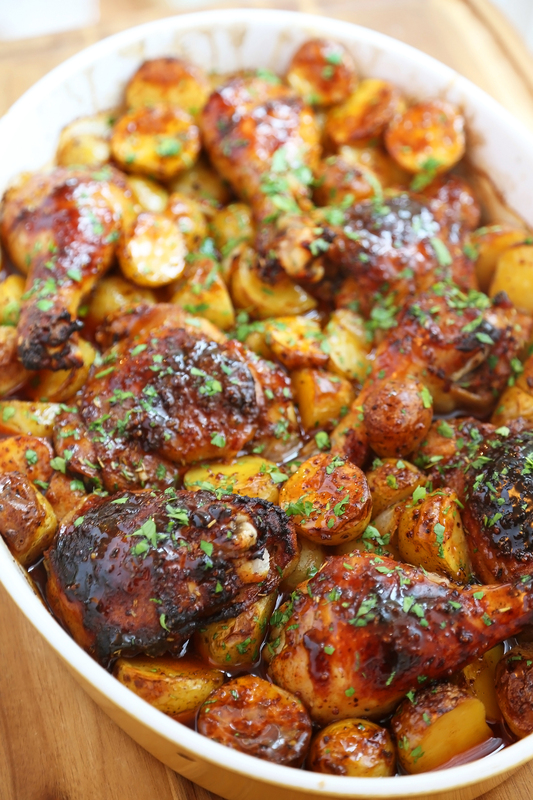 Halve those baby potatoes, chop your onions, and arrange them with the marinated chicken in a large baking dish. Arrange your potatoes and onions around the dish. I like to give one more generous sprinkle of salt and pepper at this point. Who doesn’t love a flavor boost! Pop your dish in the oven and set it for an hour. Now, the fun part begins… Let’s make our delicious, glistening apple cider glaze! This glaze is my absolute favorite part of the whole dish! Painted on the perfectly tender chicken, it really makes the apple flavor pop. The addition of tangy grainy mustard and sweet-nutty Holland House Sherry Cooking Wine really amps up its mouthwatering goodness! This cooking wine is my go-to when I want to add a little subtle sweetness to sauces, soups, and especially roasted meats and vegetables. I love it as a flavor booster for stir fries and creamy mushroom sauces, too. The glaze is a simple mixture of apple cider, brown sugar, Holland House Sherry Cooking Wine, and a dab of grainy mustard. Or, you can just add whole mustard seeds if you prefer. Let it bubble up in a little pot on your stovetop, whisking well. Then, turn off the heat. As the mixture cools, it will thicken considerably. If it appears too thick after about 20 minutes, add a tiny teaspoon extra cooking wine, or water. 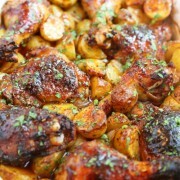 Once your chicken is cooked, use a pastry brush to coat the glaze all over the chicken, potatoes and onions. Sprinkle with some fresh chopped herbs like parsley, thyme or rosemary. The sweet-smoky aroma and taste will win your dinner-hungry heart. This delightfully autumn-inspired dish can easily become a new favorite for apple lovers. It’s a simple, scrumptious all-in-one meal for your family, which makes it easy to enjoy and easy on whoever’s left to clean up. Try it tonight! Check out more of my favorite apple recipes from over the years! In a small bowl whisk together apple cider, olive oil, garlic, paprika, salt, onion powder, rosemary, pepper and allspice. Add to a large bowl or re-sealable plastic bag with the chicken pieces, and toss to coat pieces evenly. Allow to marinade for at least 30 minutes, up to 1 day. Place marinated chicken in a rimmed 13-in. x 9-in. baking dish. Place parts skin side up and spread them out evenly in the pan. Arrange potatoes and onions around and under the chicken. Bake uncovered for about 1 hour. 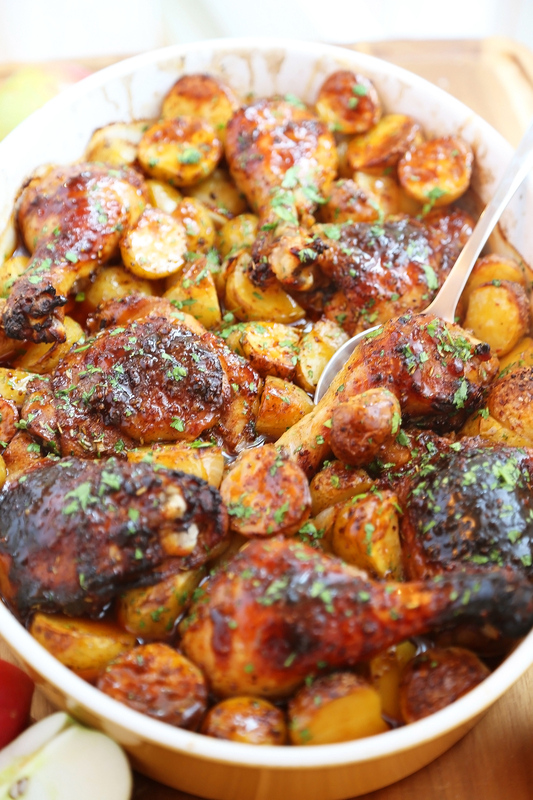 Potatoes should be tender, and chicken fully cooked with juices that run clear. While chicken bakes, prepare your apple cider glaze. Add apple cider, brown sugar, Holland House Sherry Cooking Wine, and mustard to a small saucepan. Whisk and bring to a boil, then reduce heat to low. Simmer mixture for 5-10 minutes then turn off your heat. Let mixture sit, whisking occasionally, until thickened, about 10-15 minutes. The longer you let it sit off-heat, the thicker this glaze will become. Remove baking dish from oven. Pour glaze over cooked chicken and potatoes. Garnish with chopped fresh herbs, if desired. Another fabulous family friendly recipe! This looks so wonderful for fall! Pinned!